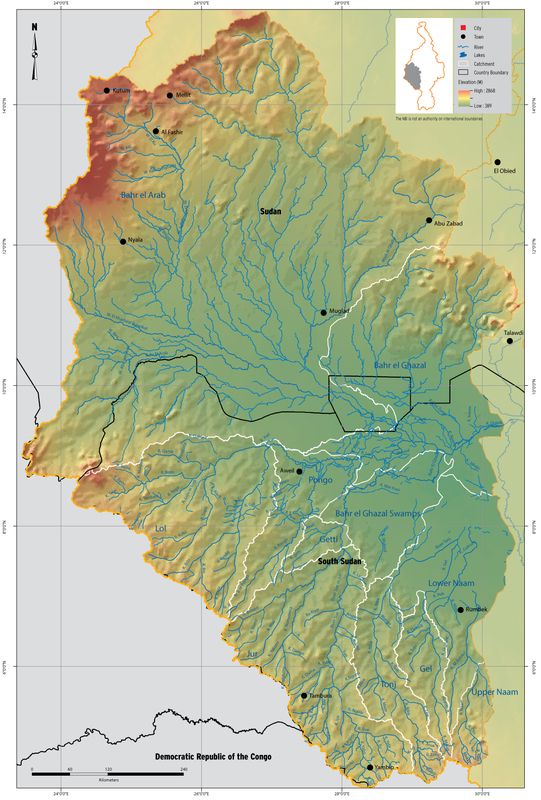 The Bahr El Ghazal Sub-basin consists of a number of tributaries that run from the border of the Congo Basin to the Nile. The sub-basin is shared by Sudan and South Sudan. The peak of rainfall in the southwestern part produces over 1,550mm of average annual rainfall, which decreases toward the northeast where the annual precipitation does not exceed 500 mm. The average annual precipitation over the entire area is 826 mm and the average annual potential evapotranspiration over the sub-basin is 1,807 mm. The sub-basin is divided into many tributaries with bank overflow and flooding. In this large area of very low slope, nearly all the basin runoff and precipitation evaporates.